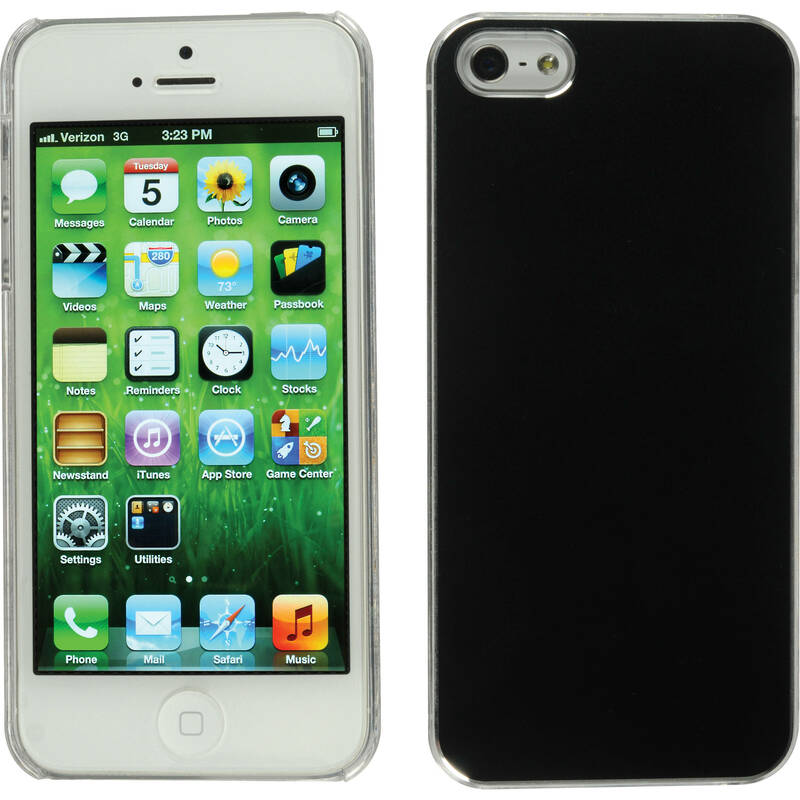 The black Aluminum Snap-on Case for iPhone 5, 5s & SE from XUMA protects the back and sides of your phone. A hard shell aluminum back provides strength while clear plastic edges won't cover the look of the phone. There's also a raised lip around the edge to prevent scratches when the phone is placed face down on a table. Access to all the phone's ports, controls and cameras is always maintained. The snap-on case features side cut outs to access your phone's volume controls. 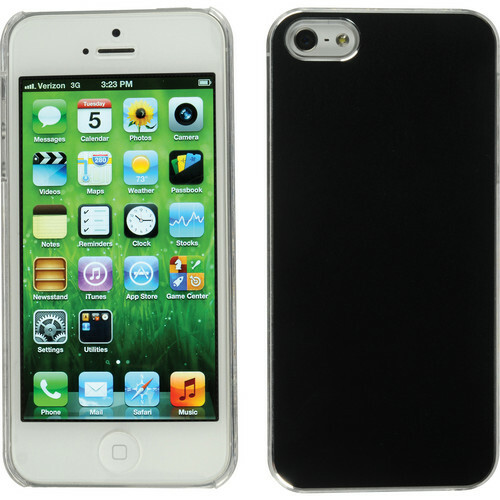 The case includes a screen protector, applicator card and 3.0 x 2.5" cleaning cloth. Box Dimensions (LxWxH) 8.95 x 4.6 x 0.85"
Aluminum Snap-on Case for iPhone 5, 5s & SE (Black) is rated 4.2 out of 5 by 9. Rated 4 out of 5 by butcheee from Have you ever wanted to slide your phone down the bar? If you're into the minimalist thing, this is a nice cheap case. Not much in the way of protection, I'd say about a half a step up from having no case at all. Very smooth back, a little slippery tho. Rated 3 out of 5 by metamorphis8 from Decent Quality, Time Will Tell I bought this case for a recent IPhone SE purchase. This case fits well, and the back is very thin aluminum. The sides, however, are clear hard plastic. I wish they had also been made out of some metal. The case has that one-drop, one use feel to it. In other words, it will likely protect the phone in the event of a drop, but will probably destroy the plastic sides, if the phone falls on one of the edges. Of course, I might be wrong about this, but haven't found the courage to test my hypothesis. The combination hard shell/silicon cases will likely protect the phone over multiple drops, as has been with the Incipio case that is protecting my IPhone 6. The tradeoff is that these cases are much bulkier. Given the price, I figure this one will still pay for itself if it protects the phone once. Also, be aware that the cutouts are very broad. They are not cut to the specific ports and buttons, instead, are long open spaces that leave all the buttons, ports and speakers available, but also the frame of the phone. I would likely return the case, but the cost doesn't justify the return postage. Rated 1 out of 5 by Reggie from take care Thats not a so good stuff. It's sensitive to hot places like a cars. Once you forget it in your car maybe you have to throw it away. Rated 5 out of 5 by Kenneth R. from Solid case I purchased this for my wife and she loves it. Solid construction and easy to install. Rated 5 out of 5 by Kenneth R. from Great, inexpensive, case. I bought this for my wife and she loves it. I would buy another. Rated 5 out of 5 by Sisa from Great Case It's really stylish and light. Amazing price for this product! from what material made screen protector?